The RE302 Ecoline shocks are suitable for 95% of all twinshock motorcycles above 200CC. The standard RE302 is delivered with parts of anodised aluminium and always has black springs. We also supply every length in a black edition where all aluminium parts are black anodised, with black springs. - Top mounting EYE, bottom mounting EYE > available in lengths 270-420MM. - Top mounting EYE 16MM, bottom mounting clevis/fork Honda 20mm x 10/M10 > available in lengths 300-420MM. - Top mounting EYE, bottom mounting clevis/fork Suzuki 22mm x 10/M10 > available in lengths 270-420MM. ALL YSS shockabsorbers are approved by the German TÜV to ensure safety and quality. For Germany and Switserland, countries where ABE is obligated we deliver a wide range of RE302's with this model-specific ABE certification. For other countries we can deliver these shocks as universal in all lengths, but when ordering, ALLWAYS fill in the make and model of your motorcycle, we will convert the specs and mountingpoints to fit your specific bike, so the shocks are actually never universal. 1 competitor to the RE302 shocks are the Hagon 31011 twin-shockabsorbers purely by price-range. The Hagon shocks are simple hydraulic shocks, but have almost the same price as the YSS Ecoline gas shocks, which are by type of shock much better shocks. Price quality rate: YSS beats the Hagons easily. Competitor with exactly the same kind of shocks are Wilbers suspension 530TS Ecoline twin shocks. 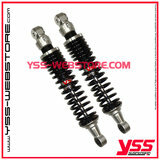 They are almost equally good shocks compared to the YSS Ecoline but with a price of € 695.- per set they have 3 TIMES (!!!) the price of the YSS Ecolines. 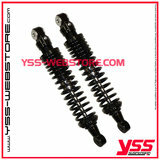 Price quality range the YSS shock will easlily beat the Wilbers shocks.